Probate is the court-supervised process of settling a decedent's (deceased person's) estate and distributing his or her assets according to the provisions of a will or pursuant to laws of intestate succession. New Mexico is one of 18 states as of the time of this writing to adopt the Uniform Probate Code, a nationally-recommended set of laws governing the probate process. The Uniform Probate Code is codified at Chapter 45 of the New Mexico Statutes. Probate of an estate takes place in the probate court of the New Mexico county wherein the decedent resided at the time of death. Contested cases may be brought before the district court. When a decedent leaves property titled in his or her name individually, such property is subject to probate. Any realty the decedent held as a tenant in common must also pass through probate. If the decedent's estate includes realty not situated in the county where the estate is administered, NMSA 1978, 45-1-404 provides that a notice of administration be filed in the county wherein any ancillary real property is situated. The Uniform Probate Code also addresses non-probate transfers of property (codified in New Mexico at NMSA 1978, 45-6-101 through 45-6-417). Property held with a survivorship interest, in a trust, or with a beneficiary designation (such as a recorded transfer on death deed) transfers outside of probate. A surviving spouse in New Mexico who occupied a homestead as community property with his/her spouse may also avoid probate by filing an affidavit of transfer of title to homestead under NMSA 1978, 45-3-1205. The first step of probate is making application for appointment as personal representative (PR), who is the fiduciary in charge of settling and distributing the estate; administration of the estate cannot begin until the court authorizes a personal representative. Depending on the testacy status of the decedent (whether the decedent died with a will), the personal representative may alternately be referred to as an executor or an administrator. An executor is someone named by the decedent to carry out the provisions of his or her will, while an administrator is a person selected by the probate court when the decedent dies without a will or the will does not name an executor of the estate. NMSA 1978, 45-3-203 establishes the priority of persons to be appointed PR of a decedent's estate, with the executor named in the decedent's will having highest priority. If the decedent died without a will, the surviving spouse has the highest priority to serve, followed by the intestate decedent's heirs. A person petitioning the court to serve as an estate's administrator must obtain waivers from each person with a higher priority to serve, if applicable. To officially begin administration, the court issues letters appointing the PR. When the decedent dies intestate (without a will), these are called letters of administration. When the decedent dies testate (with a will), these are called letters testamentary. The letters act as proof that the personal representative named within is the acting and qualified PR, enabling him to act on behalf of the decedent's estate and carry out the duties of administration. The Uniform Probate Code establishes rules for providing notice to heirs and creditors of a probated estate. Once appointed, the PR must provide notice of appointment to heirs and devisees within 10 days (NMSA 1978, 45-3-705). A devisee (or beneficiary) is anyone listed in the decedent's will to receive assets from the estate. An heir is anyone entitled to an intestate decedent's property. Statutes also require the PR to provide notice to creditors to file claims on the estate within 4 months of the publication of such notice (45-3-801). Among a PR's duties is to collect the decedent's assets and take inventory of the estate; file applicable income and estate taxes; pay the decedent's debts and the costs of estate administration; and, finally, distribute the remaining assets to the heirs or devisees. The allotted shares of heirs in an intestate estate are outlined at NMSA 1978, 45-2-101 through 45-2-104. The PR may have to petition the district court to partition an estate when multiple heirs or devisees are entitled to undivided interests in realty. The court may make partition or direct the PR to sell property that "cannot be partitioned without prejudice...and which cannot conveniently be allotted to any one party" (NMSA 1978, 45-3-911). 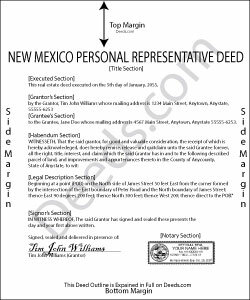 In New Mexico, a PR deed is an instrument that conveys title from the decedent to a devisee, heir, or purchaser, typically with special warranty covenants. The special warranty deed is a statutory form in New Mexico, codified at NMSA 1978, 47-1-44(5). By offering a fiduciary deed with special warranty covenants, the PR covenants with the grantee that the premises conveyed are free from encumbrances made by the grantor, and that the grantor will warrant and defend the grantee's title against the lawful claims arising by, through, or under the grantor, but against no other persons (47-1-38). To successfully distribute real property to successors in interest, whether they be devisees listed in the decedent's will or heirs entitled by laws of intestate succession, the PR must confirm the successor's title through executing and recording a personal representative's deed. Some title companies may require that a court order be entered before transferring a decedent's property. When the grantee is an heir or devisee and the conveyance is made with no consideration, the PR deed may be alternately referred to as a deed of distribution. The deed, recorded in the clerk's office wherein the subject realty is located, serves as "conclusive evidence that the distributee has succeeded to the interest of the estate in the distributed assets, as against all interested persons" (NMSA 1978, 45-3-908). An interested person is an heir, devisee, or other beneficiary or creditor having a property right in or a claim against the decedent's estate (45-1-201(26)). A PR deed names the authorized executor or administrator of the estate as the grantor, along with details about the probated estate, including the decedent's name, the county of probate, the cause number assigned to the estate by the probate court, and the PR's date of appointment. As with other transfers of real property, it requires the grantee's name, address, and vesting information, and contains a complete legal description of the subject parcel, along with parcel identifier, and a recitation of the source of title. Detail any restrictions or agreements associated with the premises. Whether the PR executes the deed to a distributee or to a purchaser, the instrument must comply with New Mexico's standards for form and content of instruments pertaining to interests in realty. The authorized personal representative must sign in the presence of a notarial official before recording the deed in the appropriate county clerk's office. Because New Mexico is a nondisclosure state, certain types of personal information, including the consideration exchanged in a transfer of property, are withheld from public record. Most transfers require a Real Property Transfer Declaration Affidavit, which details the relevant sales information. This affidavit must be filed with the assessor's office within 30 days of recording the deed. If the deed conveys title to a purchaser, include a statement of consideration paid for the transfer and an accompanying New Mexico real property transfer declaration affidavit. Note that transfers made to effect a court-ordered partition or establish a distribution from an estate are exempt from the affidavit requirement (NMSA 1978, 7-38-12.1(D)). The information provided here is not a substitute for legal advice. Consult an attorney with questions regarding personal representative's deeds and probate procedures in New Mexico, as each situation is unique. Janice S. said: Really easy downloading the forms the directions everything was really easy thanks! William M. said: I got what I needed and did exactly what I needed. All legal and no hassle. Thanks Deeds.com, you made the job much easier. Maria G. said: Very easy and fast. Couldnt ask for anything better.